My sister had a clean out of her tea drawer. So I got some of those large tea flower type things that open up in boiling water, as well as some small hard lumps of tea shoots. 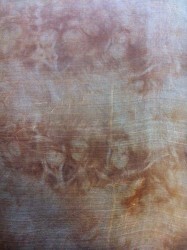 Of course, using tea in any form in the solution is going to produce some colour (brown) and it contains tannin, a natural mordant, so it should promote colour in the silk. What I call the tea “balls”. 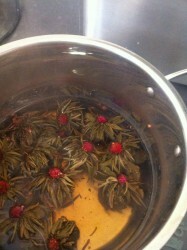 Tea flowers opened in boiling water. I made a solution of water and the tea flowers. Lovely reddish brown water. 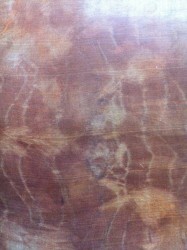 Three pieces of silk were tightly wrapped with, respectively, brown onion. 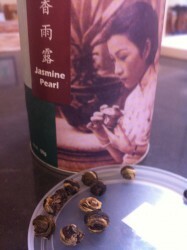 the tea flowers, and the tea “balls”. Then simmered in tea flower solution for 30 minutes. 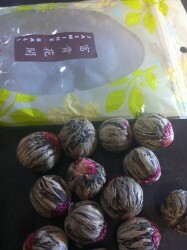 Silk wrapped tightly around tea flowers and boiled in tea flower solution. Silk wrapped tightly with brown onion skin and boiled for 30 minutes in tea flower solution. 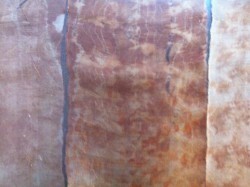 The three samples are in fact different colours! L to R: tea flowers, brown onion, tea “balls”. The colour is limited by my technology so this is not the most exciting post I’ve made. 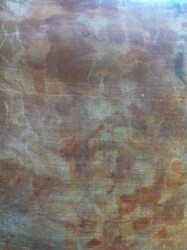 This entry was posted in Natural dyeing. Bookmark the permalink. 1 Response to Don’t waste that tea! I’ve never heard of tea flowers or balls but lovely fabrics! Is soy milk a mordant?